England had planted colonies on the Atlantic coast; she said that by a treaty the Iroquois or Six Nations of New York had sold all the country west of the Alleghenies to her provinces of Pennsylvania, Virginia and Maryland. "This," the Six Nations had asserted, "is our empire. We have conquered it. The other Indians living there do so because we permit them." France said that when her Marquette and LaSalle explored the Mississippi River and claimed it for France, they included the whole country watered by all the rivers flowing into the Mississippi from the east and from the west. This was another large bargain. The Indians said that the Iroquois had lied; they had not owned the lands of the Ohio Valley. These belonged to the tribes living upon them. Let the French stay in Canada; let the English stay east of the mountains; the Indians would keep the Ohio Country. The French were more popular, but the English appeared to be the stronger—and it is Indian policy to side with the stronger party, so as to get the spoils of war. Therefore when in the summer of 1749 the Wyandots, the Shawnees, the Delawares, the Mingos (who were roving bands of Iroquois), saw a large detachment of French soldiers descending along the River Ohio, burying leaden plates at the mouths of the streams, tacking the arms of France to the trees, and warning English traders to leave at once, they sent messages to the governors of Pennsylvania, New York and Virginia. "The French mean to steal the country from us. We ask our brothers the English for protection." At this time there were no white settlements west of the Allegheny Mountains, but the province of Virginia was supposed to extend westward even to the Mississippi. At least, it reached to the Ohio River and included southwestern Pennsylvania. In reply to the Indians, Governor James Hamilton of Pennsylvania dispatched Trader George Croghan, with presents and treaty talk. To spy out a tract for settlement near the Ohio and to encourage the Indians with friendship words, the Ohio Company of Virginia dispatched the pioneer surveyor Christopher Gist of the Yadkin River, North Carolina. The Ohio Company had been formed by Lawrence and Augustine Washington (George Washington's elder brothers), several other Virginia and Maryland planters, and Merchant John Hanbury of London, to settle five hundred thousand acres of land granted them by the king of England, at the Ohio River west of the mountains. Trader Croghan and Surveyor Gist left, the one from the north, the other from the south, in the same month, October, 1750. They traveled, sometimes meeting, clear into western Ohio. The Indians received them well indeed; there were councils and feasts; the Miamis of Pickawillanee town in western Ohio refused some French whiskey and tobacco, and sent four French Ottawas home weeping with sorrow. All the tribes promised to attend a great council to be held at Logstown, beside the Ohio River fourteen miles below the "forks" where the Monongahela and Allegheny Rivers join to form the Ohio. Logstown was the town of old Half-King Tanacharison, chief of the Mingo Senecas. He was called the half-king because the people whom he ruled were subjects of the head chief of the Six Nations. "It is not our custom to meet to treat of business in the woods and weeds. If the governor of Virginia wishes to speak with us, we will meet him at Albany." The Ohio Indians signed a paper by which they agreed not to bother any English settlers on the east side of the Ohio River. Still, they began to have fears. They did not wish any white settlers at all. When Christopher Gist again came to the Ohio, to survey for the Ohio Company's land in northwestern Virginia, the Delawares objected. "The French claim all the land on one side of the river, the English claim all the land on the other side. Now, tell us, where does the Indians' land lie?" Old Chief Tanacharison himself hastened north to the French fort at Lake Erie. "Both you and the English are white," he said to the French commandant. "The land belongs to neither of you. We desire you and the English to withdraw." The French commandant laughed at him. "Child, you talk foolishly. There is not so much as the black of your nail yours. It is my land; and down the river I will go and build upon it." So back went Chief Tanacharison, much alarmed. The French descended into the Ohio Country. They destroyed Pickawillanee town of the Miami league; its head chief, a Piankasha, was killed and eaten by the Ottawas. Twelve hundred French from Montreal marched south to occupy the Valley of the Ohio. A chain of sixty forts was to be built, that should extend from Montreal to New Orleans. The Indians were aroused in earnest. The English seemed their only help. Wampum speech-belts and other messages flowed in to the governors of New York, Pennsylvania and Virginia. I am left a poor lonely woman, with one son," appealed the widow of the Piankasha chief of the Miami league—the chief who had been eaten by the Ottawas of the French. "I pray the English, the Six Nations, the Shawnees and the Delawares to take care of him." "We see that the French plan to cheat us out of our lands. They make only mischief; they have struck our friends the Miamis. We wish our brothers of Virginia to build a strong house at the forks of the Ohio." Accordingly the Ohio Company engaged the best man known to them, to go into the region, warn the French to keep out, learn the location of their forts, and enlist the Indians for the English. This man was young George Washington, aged only twenty-one, but already a major in the Virginia militia and a public surveyor. He selected for his guide Christopher Gist. With a little party of seven men he set out ahorse in the month of November, 1753. At the Forks of the Ohio he stopped to visit old Shingis, chief of the Delawares. Today the city of Pittsburg covers that ground, and more. Major Washington noted the spot as an especially fine site for a fort. He turned down river to talk with the friendly half-king, Tanacharison. 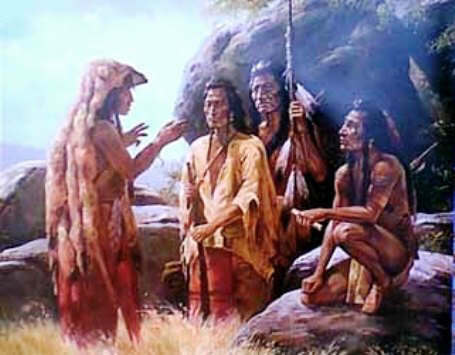 With Tanacharison, Chief Jeskakake, and Chief White Thunder, who was the keeper of the Shawnee speech-belts, he rode into the north, to talk with the French. But although he made a winter journey of four hundred miles, to Fort Le Boeuf in northern Ohio, the new headquarters of the French commandant, he got little satisfaction. The French seemed determined to stay, and were working hard to bribe the Indians. One satisfaction he did get: that he had done thoroughly and had shirked not at all. Governor Dinwiddie of Virginia at once sent men in, to build a fort upon the Ohio Company's lands at the Forks of the Ohio. Major Washington was appointed lieutenant-colonel—he might have been colonel, but he thought himself too young—and in April, 1754, started with about one hundred and fifty militia to garrison the new fort and hold it until reinforcements arrived. Part way he learned that he was too late. The French had come down, led by Captain Contrecoeur; on April 27 they had captured the half-finished fort and its small guard. They were staying there and completing it as a fort of their own. They named the fort Duquesne (pronounced Ducane) in honor of the French commander-in-chief in America, the Marquis du Quesne, governor-general of Canada. Half-King Tanacharison, who had been with the Americans at the fort, sent a message to his friend Washington. "Come to our assistance as soon as you can; come soon or we are lost and shall never meet again. I speak it in the grief of my heart." Lieutenant-Colonel Washington did not know exactly what to do. The French were reported to number one thousand, with artillery; other troops were on the way; Indians were joining; he himself was one hundred miles from the settlements, with a small detachment of raw militia, and his instructions were to make a road to the Monongahela, for wagons and artillery. Nothing had been said about fighting. To bring on a war between two nations is a serious matter. Besides, he was only a young "provincial," without field experience in military methods; and the French force was composed largely of trained soldiers under skilled officers. But the French certainly had committed an act of war first, by seizing the fort, and he must do something at once or he would lose the friendly Indians. He thought it out in his tent during a rainy night, and decided. He would push right on as far as he could, meet the Indians, build a fort of his own in the disputed territory, and if need be, wait. So he sent the news back to Virginia, and asked that reinforcements be hurried to him. He returned one of the Indian runners to Chief Tanacharison, with good word; ordered sixty men forward to open the trail; and followed with one hundred and sixty others. He soon caught up with the road cutters. They all hewed their way across the Allegheny Mountains, through the place named the Vale of Death by reason of its gloomy timber, and emerged into Little Meadows. They had been eleven days in coming twenty-five miles. As they toiled on, the outlook darkened. Traders said that the Indians were rising in favor of the victorious French. Pennsylvania declined to furnish aid. Virginia and Maryland were tardy—the pay of the militia officers had been made less than that of the king's regulars, their rations were mainly salt pork and water, and few cared to serve for this, in a wilderness campaign. Washington himself said that he would rather serve without pay and for honor only—or else earn the day wages of a laborer. But he added: "I am determined not to leave the regiment, but to be among the last men to leave the Ohio." One bright spot there was: the half-king had started with fifty warriors to meet him. "The French army is coming. Be on your guard against them, my brethren, for they intend to strike the first English they shall see. I and the rest of the chiefs will be with you in five days." That same evening he heard that the French were only eighteen miles away. He made haste to the Great Meadows, which is near the southern border of south-western Pennsylvania, some seventy miles south of Pittsburg, cleared the brush, and entrenched. "A 'charming' place for an encounter," he thought it. There was no retreat in the mind of George Washington, aged twenty-two. Christopher Gist, who had a trading house in the vicinity, also brought news, that the French were within five miles, and advised him to retire. But Washington said that it was not the time; he would be ambushed. Old Captain Jacob Van Braam, who had been a soldier in Holland and had taught him fencing and tactics and was his most experienced officer, agreed that it would not be very safe to retire far. This was a night of alarms. The dense forest surrounded blackly, and who knew what the French and Indians might be doing in it? Washington decided not to wait for attack. That would give the enemy the advantage. The longer he waited, the more restless his men would get, and the French would grow stronger. He acted on his own judgment—which, he afterward declared, was usually the better way for him, in warfare. When word arrived that the half-king was encamped six miles distant, and that his scouts were in touch with the French, inside of an hour he detailed forty men (his best shots), took no gun but tucked an extra pair of moccasins in his belt, and had set out at ten o'clock in the pitchy, rainy night of May 27, to find Chief Tanacharison, and the French. They were all the night in reaching the half-king's camp. Yes, Tanacharison would help him. So would Scarouady, the second chief. So would the warriors. Tanacharison showed him the trail made by the French. Two warriors were put upon it; followed it like hounds, and came back to report that they had found the French encamped in a bottom amidst rocks and trees, with a few cabins as shelter from the pouring rain. Now young George Washington was all enthusiasm. It was to be his first battle; he was to strike the enemy, as a soldier of Virginia and the king. He reviewed in his mind everything that he had been told by old Van Braam, and by other military men. He took counsel with Tanacharison and Scarouady. When the arrangements had been made for a surprise attack, and he understood the nature of the ground, cautioning his forty to keep their priming dry he led them by the right flank, through the dripping woods; Tanacharison and Scarouady led their warriors by the left flank. The surprise was perfect. The French suspected nothing until on a sudden they witnessed Washington at the head of his half company issuing into the edge of the bottom land. He deployed his men among the rocks and trees. The French sprang for their guns. "I heard the bullets whistle, and, believe me, there is something charming in the sound." "He would not say so if he had been used to hear many," King George of England remarked. But during the next twenty-five years Washington did hear a great many bullets, and he never was seen to shrink. The French resisted only fifteen minutes; their captain, Jumonville, had been killed at the first volley; nine others were killed, and one wounded. The remainder broke and ran, but twenty-one were captured and only one escaped to bear the news to Fort Duquesne. So George Washington had won his first victory, by his own plans. He had acted quickly. The Jumonville detachment had been scouting for him, to locate his camp for Captain Contrecoeur at Fort Duquesne. If he had delayed, fearing to venture out, he would have been besieged by a large force. The surrender of the Ohio Company's post at the forks had now been avenged; but the shots fired in this little battle were the opening shots of a ten years' war known in history as the French and Indian War. The French and Indian War, thus set aflame by Washington, resulted in military rule in America by the British army, to protect British interests, and in much unpleasantness; then followed the Revolution, with George Washington again as the leader. After the battle, however, he saw himself in a fix once more. He forwarded his prisoners to Virginia under a strong guard. Tanacharison's warriors scalped the dead French (they wished to scalp the wounded man and the prisoners too, but were not allowed) and sent the scalps, with black wampum and red hatchets, to the Mingos, the Shawnees and the Miamis, as sign that "their brothers, the English, had begun in earnest." The half king left, promising to return with forty warriors and their families. But nevertheless Washington was in a tight place. The French from Fort Duquesne would surely come down, and they might come in a hurry. He could not retreat, or he would lose the support of the Indians; and he didn't like the idea of retreating, anyway. If he could stick it out until the arrival of reinforcements, white and red, he might be all right. He commenced the erection of a palisade fort in the center of the Great Meadows, which was a grassy level two hundred and fifty yards wide, in the midst of wooded hills. The rains fell, provisions ran low, and for six days his men were without flour. Then Tanacharison and Scarouady and the forty warriors, bringing their women and children marched in; they had to be fed, also. On account of the short rations Washington named the fort Fort Necessity. He waited in vain for other Indian allies: Shawnees, Mingos, the Miamis from western Ohio. None came. One hundred and fifty militia from Virginia, who had started behind him, a month before, finally appeared; and there was an independent company from North Carolina. The independent company brought only trouble. They said that they were not militia; they had enlisted as "king's men"; their officers held royal commissions and were superior to militia officers; as a militia colonel Washington had no authority over them. Therefore the North Carolina independents would not work; they would fight, when the time came, but building forts and cutting roads was not, they considered, the proper job for "king's men." "Your honor may depend I will not be surprised, let them come at what hour they will. I doubt not if you hear I am beaten; but you will hear at the same time that we have done our duty in fighting as long as there is a shadow of hope." Meanwhile Fort Duquesne was in a state of excitement, also. The one Canadian who had escaped from the cabins had told the story. Among the officers at Duquesne there was the captain De Villiers, brother-in-law of the Jumonville who had been killed. He was hot for revenge. Captain Contrecoeur delayed only for more troops. He had five hundred, but nine hundred were on the way, and the Indians who favored the French were promising to help him. The last of June De Villiers started, with five hundred soldiers and one hundred Indians. Washington was employing his Virginians in cutting a military road; for he had been sent in to open roads. Besides, work is good, when soldiers are idle. Tanacharison himself was growing restless. His warriors were anxious to fight; they could not understand why the white soldiers stayed in one spot. The French ought to be struck again—scalps taken. The North Carolinians had been left to guard Fort Necessity. While Washington and his Virginians were laboring in the forest, miles from the fort, they learned that the French were advancing upon them. Back they rushed to the fort; and when they arrived they were completely worn out. Nevertheless they plunged into the work of strengthening the walls of the fort with logs, and with trenches, while the Carolinian "independents" looked on. Washington himself toiled like any private. But old Tanacharison feared being caught in a trap. He considered that the Meadows was a poor place for defence, and that the fort did not amount to much. Why should time have been wasted in building roads? "The French are cowards," he said; "the English are fools. Washington is a good man, but he lacks experience. He lies in one place from one full moon to another, without making any fortification except this little thing in the Meadow. He will not take the Indians' advice. So I think best to remove my wife and I children to a safer place." That he did, and most of his warriors followed him. This left Washington with his three hundred and two exhausted Virginian militia, and the one hundred proud North Carolinians; all in a make-shift log fort, commanded by the timbered hill, and drenched by the constant rain. Just after dawn of July 3 a sentry staggered in, wounded, from his outpost at the hills. "The French and Indians!" he gasped. "A redskin shot me." The drummers beat the alarm. The woods seemed quiet. Washington ordered scouts out, and formed his men in the open, to receive the attack. The scouts returned. They had sighted a large body of French and Indians only four miles distant, and coming on rapidly. Washington waited. Nothing more occurred, until noon. Then shots were fired at the men, from amidst the trees of a hill. Scarcely a sign of the enemy, except the gun puffs, could be seen; but the firing increased, the bullets pelted in, nearer and nearer; and at last the helpless Americans were obliged to retire into the little breastworks. Soon the French and Indians had invested all the hills commanding the fort. The battle was fought in the rain. The trenches filled with water, the men's muskets missed fire, in the woods the enemy were sheltered. The fort had no roof; presently bullets from the tree tops began to hiss in over the breastworks; that was bad. Washington's men were falling; and as far as known, no damage had been done to the besiegers. Tanacharison was right: the fort was poorly located and poorly constructed; but there had been no better place. At dark twelve Virginians had been killed and forty-eight wounded, out of the three hundred; the North Carolinians likewise had suffered severely. The French commander, De Villiers, sent in a flag of truce, with proposal for a parley. Washington refused it. He was almost out of provisions and of ammunition, but he did not intend to give up easily. About eight o'clock there came a second request. This time he agreed to talk. He appointed old Captain Van Braam, the Hollander, who spoke a smattering of French, to talk for him. The French seemed to want everything, and it was not until eleven o'clock that Washington gained his point: the privilege of marching out with his men, colors flying, drums beating, and with all his supplies except the few cannon. These were to be destroyed. This was bitter enough; but he had done as he had engaged to do. He had upheld the honor of his uniform to the end, and he had been "among the last men that leave the Ohio." As for Chief Tanacharison, this fall he died. He claimed that the French had put an evil spell upon him for having beaten them, with his warriors, at the surprise attack in the cabins bottoms. He never granted Washington much credit; but his warriors remained very bitter toward the French. The flag of France floated triumphant in the Ohio Valley. The Indians were disgusted. At Albany the Six Nations made reply to the defence convention of the colonies. "Look at the French; they are men; they are fortifying everywhere. But, we are ashamed to say it, you are like women, without any fortifications. It is but one step from Canada hither; and the French may easily come and turn you out of doors." The American colonies seemed unable to unite with men and funds, for a campaign. When England saw this, and heard what had befallen that "young hot-headed," Washington, she prepared to send regular troops over and drive the French out. This story of Washington Stands Fast is featured in the book entitled the Indian History for Young Folks by Edwin L. Sabin and was published by George W. Jacobs and Company in Philadelphia in 1920.